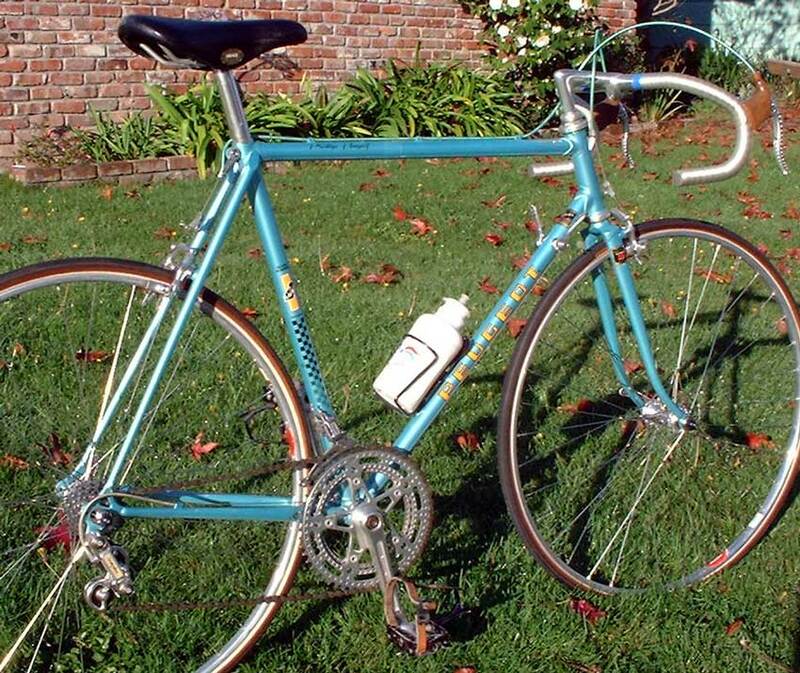 As a graduation present, in June of 1971, my grandmother gave me ninety-five dollars, and I immediately walked down to Ozzie Waite’s bike shop and purchased a Peugeot AO-8 ten-speed, my first lightweight road bike. 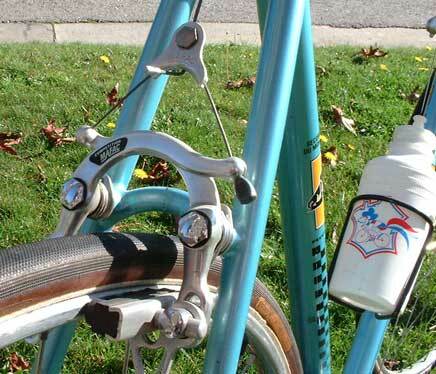 That summer, though I hardly knew how to shift gears, couldn’t fix a flat and didn’t have so much as a water bottle, I pedaled it everywhere, even through New Hampshire’s White Mountains. It was here that I ran into one Galen Farrington who noticed I was a rookie and rode with me for a while to teach me some of the finer points of cycling. And, it was while riding with Galen that I saw my first paceline. Three racers went by as if we were parked (Galen was kind enough not to hop on). I didn’t see their faces. But, I saw their bikes: Peugeot PX 10s. I was never happy with my AO 8 after that. So, when my friend Chuck Schmidt, a vintage bicycle collector, offered me one of his 1979 Peugeot PY 10 CPs (he had two at the time), I couldn’t resist. It’s not the PX 10 I always wanted, but it’s similarly equipped and every bit as magical to me. What makes the CP unique is that you had to custom order it from the bicycle shop and it was built for you in Peugeot’s frame shop in France. So, this bike sports specific geometry and custom paint instead of the stock design and colors found on the PX 10s, which you could have purchased off the showroom floor from any Peugeot shop. 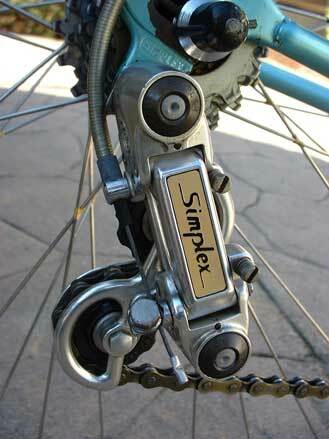 Another interesting upgrade is the Mafac Competition centerpull brakes, which are attached to braze-on brake posts. Note the beautifully drilled levers. 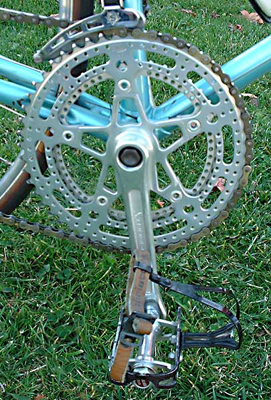 The Stronglight 105 bis crankset (also riddled with holes) has special-order 172.5-millimeter-long crankarms, too. And notice the Ideale 2002 seat. Like the rest of this bike, it’s in excellent original condition. 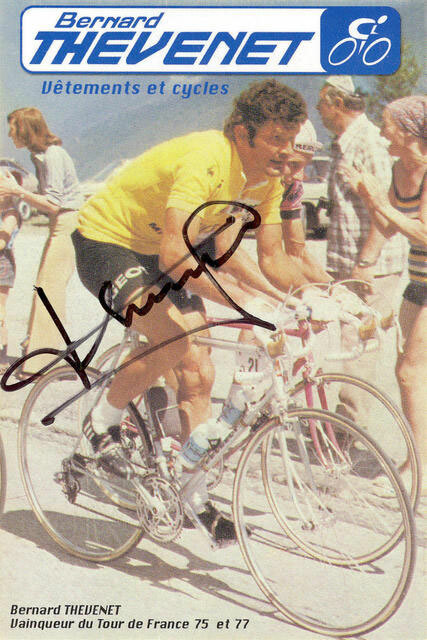 Interesting Trivia about the PY 10 CP is that it’s the model Frenchman Bernard Thévenet won the 1977 Tour de France on. 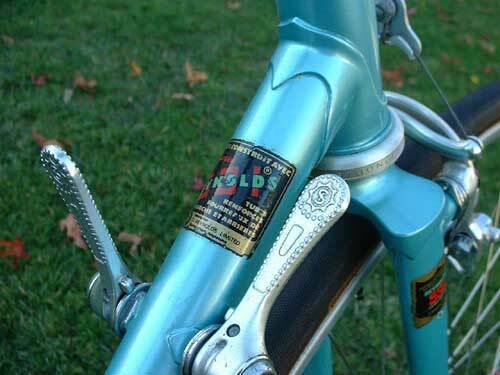 So it’s fitting that the bike features French Reynolds tubing decals and is mostly equipped with French components right down to the tied-but-not soldered spokes. 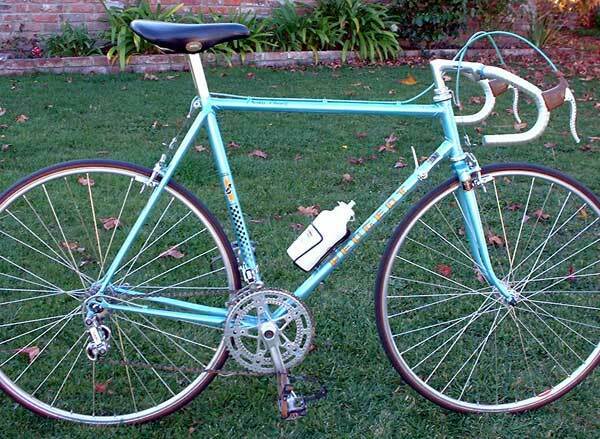 I like that because I see many vintage full-Italian road racers but I rarely spot a full-French one. 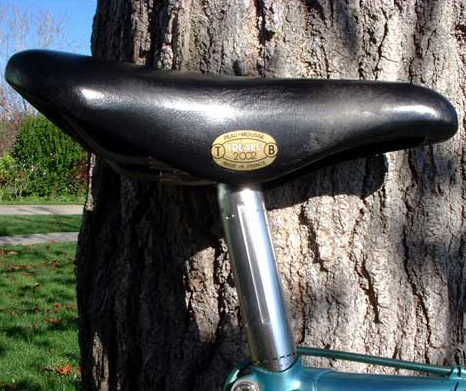 Which seems strange to me because it was the PX 10s that ruled the roads back in New Hampshire where I grew up. 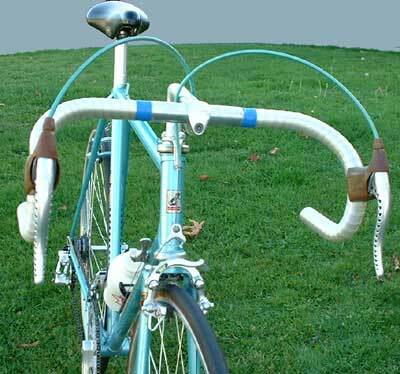 Chuck tells me that one of the reasons we don’t see beautiful French road bikes like this with elegant Mafac brakes and Simplex derailleurs is because for whatever reason, they’ve become extremely rare. I’m lucky to have this one. My name is Clay Moseley and I am a cyclist from New Mexico. Specifically, I grew up in Ruidoso, New Mexico. My ninth-grade English teacher was Galen Farrington, who also became my cycling coach/teacher back in the late 1980s. Someone told me that you mentioned him on your website, and I asked Galen about it. He was amazed because you had just contacted him about it also. He is astonished at the funny circle of connections with that day back in 1969. Anyway, I just wanted to let you know a little bit more of Galen’s input as a teacher and a coach in the sport of cycling. With his contact of young wayward kids, he has been able to produce some pretty successful cyclists. Not only have most of his cyclists gone on to become successful people and continue to enjoy cycling as a lifetime activity, but he has had a handful continue on to become professionals and national champions (and beyond). One of his early protegés was a guy called Bart Bowen. Bart rode for Kent Bostick’s Ten-Speed Drive team, then turned pro for Eddy B’s Subaru-Montgomery team. There, he was a teammate with many great riders, including a very young Lance Armstrong. Bart went on to become the first solo breakaway winner of the Core-States USPRO Championships in 1992. Bart has been a member of the professional world road championships team many times (9 times, I think), and had many great European performances in one-day and stage races. He has also been the US cyclocross champion and supercup series champion (twice there), in addition to being on the world’s team for that discipline on a couple of occasions. Bart rode for Saturn for something like eight years before a terrible crash knocked him out of the professional scene for over a year in 2000. He is now a father and rides part-time for Kona in mtn. biking and cyclocross while supporting his wife’s summertime cycling endeavors. Galen also had another cyclist with a very brief, but brilliant amateur and professional career. Unfortunately, this particular cyclist was wooed by his European team coaches to start taking performance-enhancing drugs, and that led this particular cyclist to have some personal crises and ended his career far too soon. His name was Roger Marr and he was considered by many coaches at the time to have more talent than any other US cyclist (and most possibly in the world). He was able to come from nowhere and put the screws to the likes of Jonathon Vaughters, Lance Armstrong, George Hincappie, Jonas Carney, and etc. He won the national junior tour in 1989, and went on to sweep many European junior races that year. That landed him a pro contract with a team in Spain for the next season. He went there, won some big stages in some of the toughest stage races, but that was when he was led astray and his career was ruined. Galen tried to get this guy back on track, but the damage was done and there was no return to cycling. Galen does still keep up with Roger and his family, and only now do they realize what all he did for them. Personally, I have probably the most to say for what Galen has done for me. I did not really have the natural talent that Bart and Roger possessed, but somehow Galen saw something in me that convinced him I would be a successful cyclist. I was a much slower starter, and only had a modest career as a junior and first-year senior. I went straight to college after high school, but he continued to coach me and convinced me to keep at it. I finally started seeing some real results, first as a collegiate racer, then as a category 2 in the bigger races in the Southwest. I was picked up by a team out of Mexico (of all places) and was able to get to bigger races where I was noticed by Kent Bostick and Team Shaklee. They gave me a spot on the team and in the first year I won some of the National Cup races and the individual National Senior Time Trial Championships (1994). I was instantly whisked away by the US National Team by then head coach Chris Carmichael. I had qualified for the 1995 Pan American Games in Argentina, so I had a tough schedule ahead to prepare for that 55km time trial. I raced with the likes of Tyler Hamilton, Freddy Rodriguez, Kevin Livingston, etc. in many European and South American races, mostly as a domestique, but sometimes for myself. I began to win a lot of stuff, and was the eventual winner of the 1995 Pan American Games time trial. I turned pro after that and was mostly on domestic duties, both physically and geographically. I then got offers from some South American and European teams to race for them. I tried my hand in the European peloton for a while, but alas, my need to get back home and start a “real” life got the best of my mental state. I came back in 1997, had a great season, then started 1998 and realized I needed a break. I am now riding and racing for fun, and actually winning some triathlons here and there. But, it is the love of the sport that Galen gave me, and will always be with me. Galen had to help me through a lot of that. His abilities as a coach were instrumental in helping me win and getting me through the tough times. The story you wrote of his helping hand did not surprise me at all. That is the way he is. You may have been the first in the long line of cyclists he helped out . . . In Clay’s note he mentions Roger Marr by name. I was a member of the Bridgestone junior team when we first met Roger and his unique qualities as a rider and a person at the 1989 Tour of the Gila. I believe he came in third to my teammates Wayne Gamber and Ed Fiedler and we quickly picked him up to come race for us at the 1989 Tour de l’Abitibi. Our great friendship led to us working all out on the final day of 1989 Tour of the Future to help reel in a break that would have taken the victory away from Roger. What many people fail to realize is that Roger won this race against an illegal combine of two US national teams that were working as one, that included a very impressive group of riders (Julich, Hincapie, Eric Harris, Fred Rodriguez, Chan McCrea and many I cannot remember . . . it’s been 18 years). I have lost touch with Roger and if you or anyone else has a way of contacting him please let me know. Just let him know Bubba from Texas is looking for him. Please feel free to share my email with him or anyone else that might get me in touch with him.